I have a habit of taking on too many projects. Characteristically, I decided that it would be all right to tell my sister that sure, I can make her a fairy corset. I enlisted her help in cutting out the corset, but there was a small fiasco where not all the pieces got cut out and I was afraid I wouldn't get it done. I started sewing at 4:00 on Saturday afternoon the day before Faire and she was wearing the finished garment before midnight of the same Saturday. Amazing. Funny story, actually. The banque took place in Holland, MI, during the Tulip Time Festival. 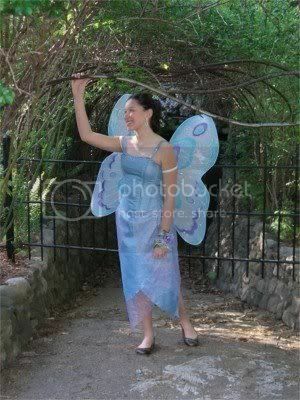 She had at least one small child point at her on the way to the restaurant and say, "Mom, look, a fairy!" Which is just cute. The original version, sans shoulder straps, glitter paint, and big wings. The skirt was designed by Holly and constructed by Holly and my mother. In order to avoid clunky hems and keep the "floaty" feeling of the fabric, they cut out each individual petal with a woodburning tool. Since the materials, a sheer and some poly silkessence, are both synthetic, the heat from the tool melted the edges and sealed them, thereby keeping them from fraying. It worked much better than any of us anticipated!